Quaint shops, colorful galleries and restaurants teeming with some of the region's brightest culinary masters make the Plaza a hub for the city's most vibrant happenings year-round. The historic centerpiece of Santa Fe, the Plaza sits at the heart of downtown, lined with lush scenery, trees and benches where travelers can unwind or partake in some people watching. A showcase of the region's culturally dynamic music, design, art and dance, it's home to many monuments, local businesses and galleries filled with gorgeous Native artwork. 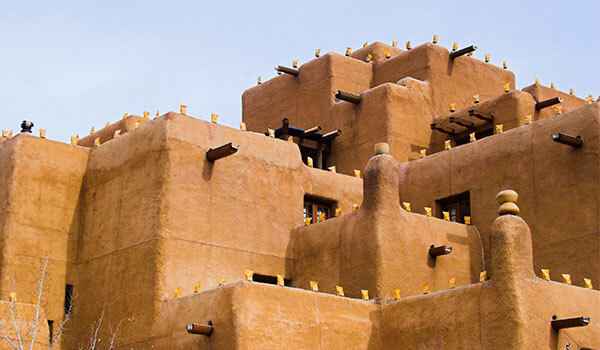 Visitors from all over flock to the center of Santa Fe to revel in its vital energy. Is parking readily available at the Plaza? Guests can find several paid covered parking garages right onsite, as well as street parking around the plaza. Parking garage rates vary but generally cost $2 per hour with a $10 per day maximum rate. Hours vary with many garages in downtown open from 6:00 am - 10:00 pm and some open as late as 1:00 am. What are some of the must-see sights? Walking around the famous square is a must as its the center of one of the oldest cities in North America and a monument to the rich heritage of Santa Fe. The Cathedral Basilica of St. Francis of Assisi can also be found just a short stroll away, and is a gorgeous southwest architectural touchstone.